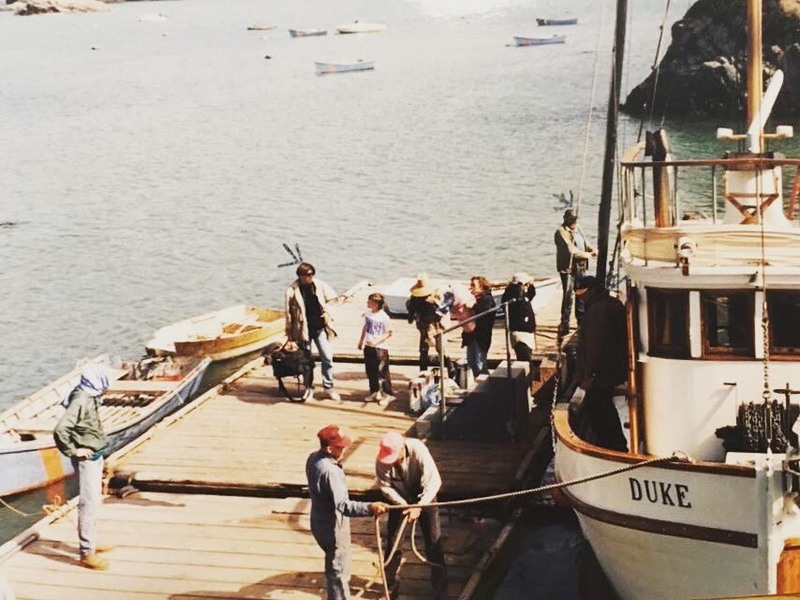 Step aboard F/V Duke and step into a time when boats were built tough. Since prehistory, the waters of the Salish Sea and Alaska have belonged to people who built their lives around their relationship to the sea. A lot has changed since the days of wooden fishing vessels, small villages and family fisheries. One thing still remains the same; the pure, untamed and wild beauty of these northern waters. Join us on a voyage of new discoveries, and enjoy these views as they were meant to be seen: from the sea. Join us on our lovingly restored wooden vessel. Orca are a common sight for us. Capt. Ryan knows their favorite spots! Murrelets. The San Juan Islands are the perfect place for birding. Duke is a very comfortable vessel to spend the night on. Arbutus menziesii, or Madrona trees shed their bark in brilliant colors, and are to be found all over the islands. And Capt. Ryan will pick you up in time for a warm drink and dinner! The Northwest has a palpable beauty that you can witness fully on your on trip in the San Juans. From Anacortes to Sucia and everywhere in between, you'll have the chance to explore spots in the San Juan Islands that the big ships would never dream of visiting. Discover the caves and sandy beaches of Sucia Island. Enjoy a day of shopping and sightseeing in Friday Harbor. Meet our friends on Orcas Island as you wander around the waterfront of Deer Harbor. 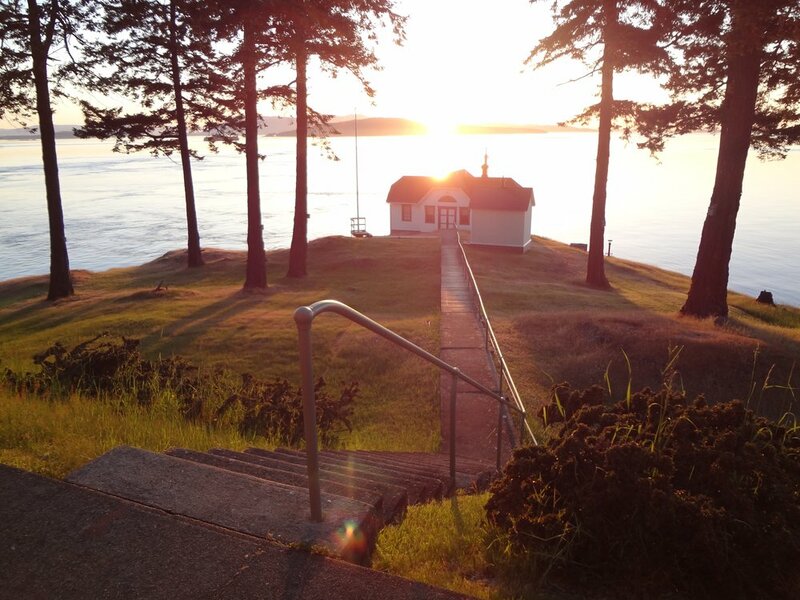 Or, get away from it all with a quiet hike across Jones Island where you'll find one of the most pristine sunset watching spots in all of Washington. Our itinerary is as flexible as your imagination, and we're happy to use our years of cruising knowledge to help you plan the trip of a lifetime. Combining visits to pristine State and National Parks amongst the islands with a naturalist bent, Duke provides one of the best island experiences in the Northwest. We can take 2-4 Passengers on personalized San Juan Islands vacations. Our season runs from May to October. While aboard, you will learn about the natural history of this unique place. 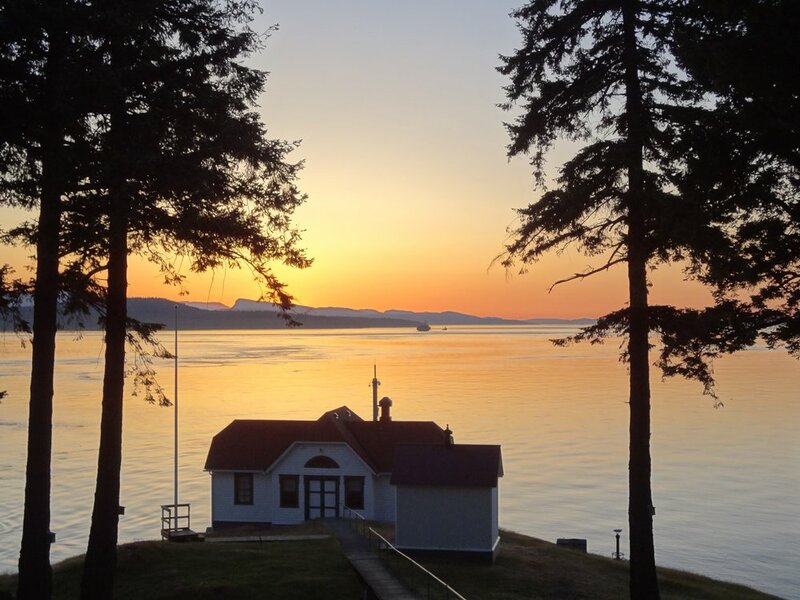 You will also have a chance to see the wildlife that makes this place famous; orca and humpback whales, Dalls Porpoise, and an assortment of exotic shore birds and birds of prey. You will be able to hike ashore on the well loved trails of islands like Stuart, Jones, San Juan, Lopez, Shaw and Sucia. A beach bonfire is a great way to round out the evening on a beach like the one Clark and Barnes islands boast. Our kayaks are a great way to get up close with nature, and to work off some of that delicious food! Board and Disembark in picturesque Friday Harbor. From Friday Noon to Sunday Noon. Drive on or walk on the ferry from Anacortes to Friday Harbor. We will meet you as you get off the ferry. 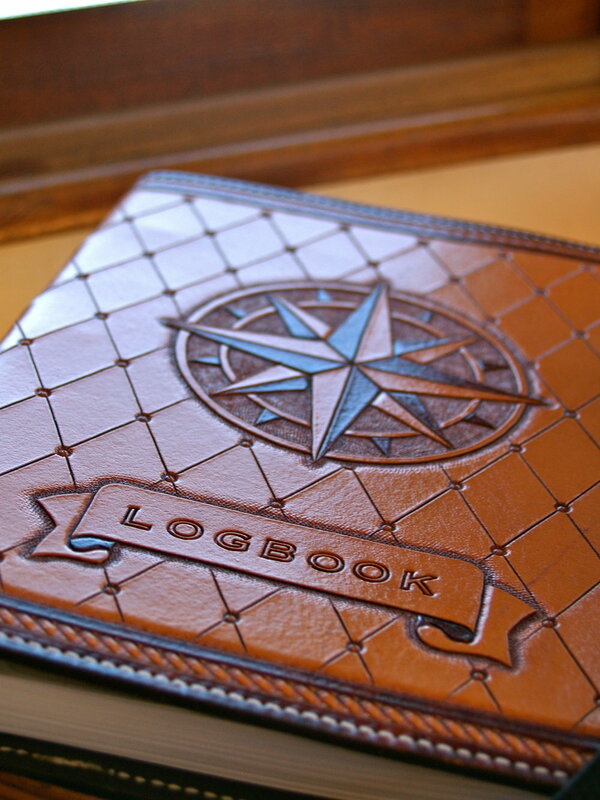 Step aboard and settle into your cabin. We get underway immediately for an island anchorage for the night, after looking for whales and porpoises and the San Juans' resident bird collection. We may stop for the night at Jones or Roche Harbor. Enjoy sunset aboard the ship, or a beach stroll ashore. An evening kayak is a great way to end the day! Visit Stuart Island and a moderate hike to historic Turn Point Lighthouse. Back in time for a great dinner and evening watching the sunset. Locally sourced, home- cooked meals! Board and disembark in Friday Harbor, San Juan Island. From Friday Noon to Monday Noon. Much like the 2 Night Weekend Getaway, but with another night to explore the islands. Use the extra night to paddle a kayak in a quiet cove, or go for a hike with a bottle of wine to watch the sunset. Board and Disembark in Bellingham, Washington. From Saturday Noon to Friday Noon. See all there is to offer in the San Juans. Besides seeing pristine islands in the State and US Park system, enjoy time in the communities that make this place special. A visit to Rosario Resort on Orcas Island, Friday Harbor on San Juan Island and a visit to the Whale Museum. This trip is the perfect way to see everything. There are also opportunities to do guided activities through vendors ashore. A guided kayak? Whale watching on a fast boat? A bicycle ride to Mt Constitution? All of these are possible while on the 6 day trip. We will contact a vendor we know and trust, and you pay them directly. Just ask! Duke isn't a luxury liner, but you'll find her cozy nonetheless. 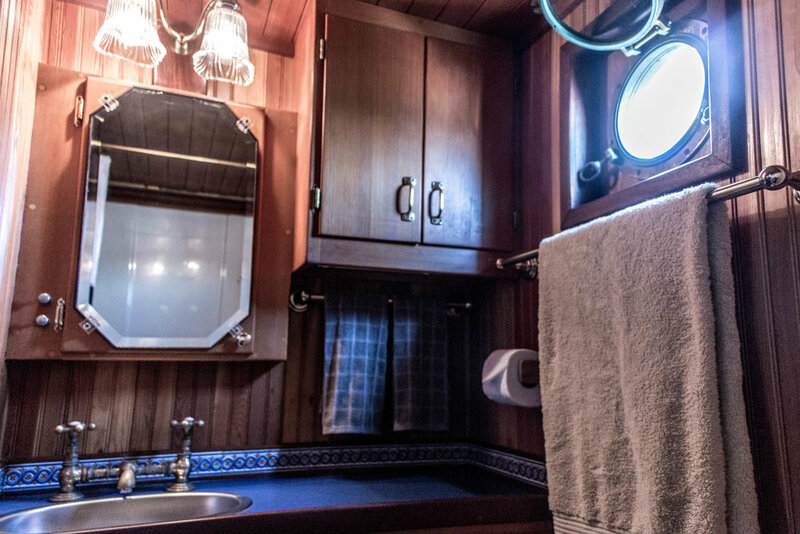 Her conversion to a liveaboard vessel meant the installation of some features that fishermen of the past would never dream of. 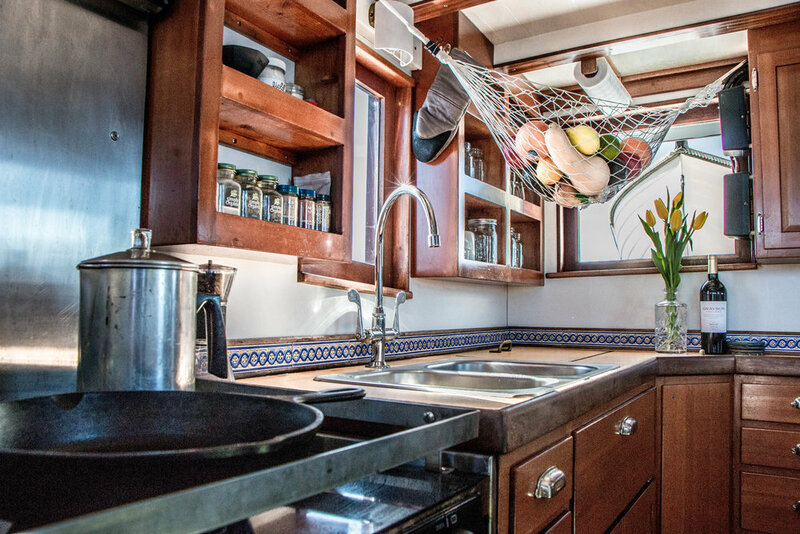 Duke has an efficient and well appointed galley, with all the perks of land from hot water to refrigeration. 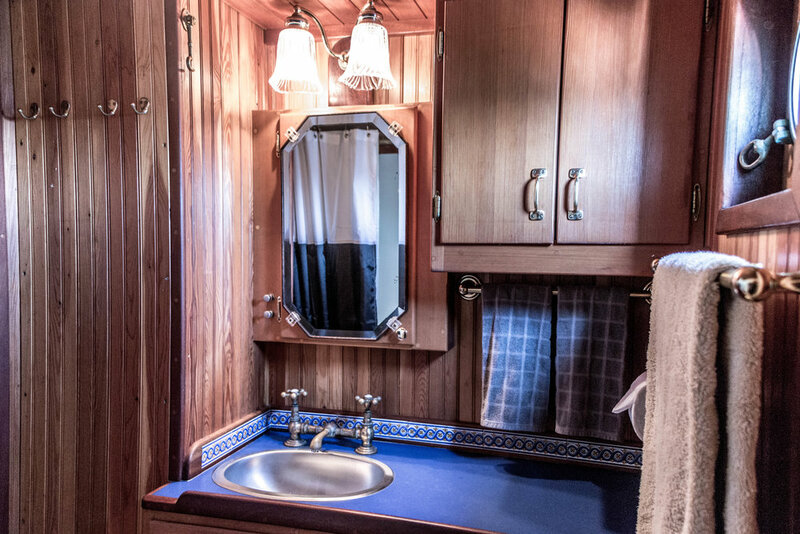 The forecastle carries 4 bunks, accessed by a trapdoor in the wheelhouse. The wheelhouse is the heart of the vessel. Enjoy the view from the helm, and help yourself to a pair of binoculars to see wildlife and find your way.. All of this is centered around a cozy dining table in lovely finished wood. The main cabin carries a queen- size bed that folds up into a comfortable reading couch during the day, with a table to write on as well. 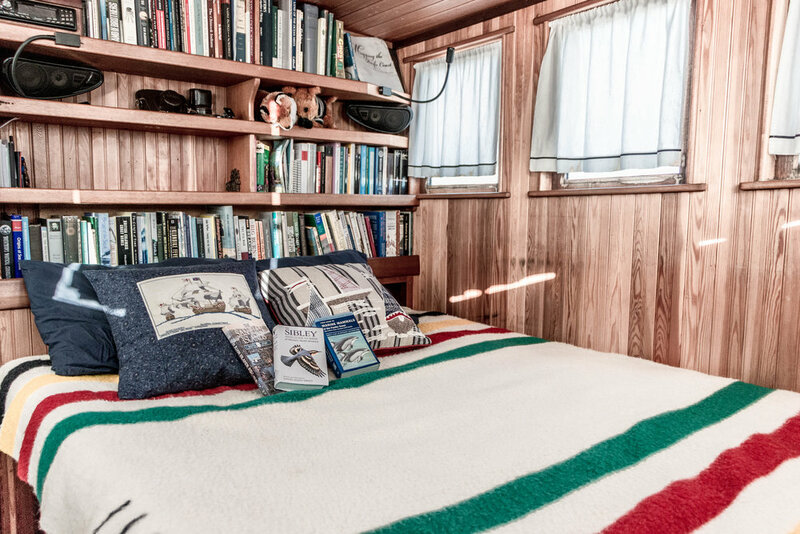 Enjoy a cozy night around the Dickinson stove while you pull a book from our shipboard library of some of the greatest naturalist writings of the Pacific Northwest. On deck, she has her stabilizers, her original anchor windlass, a small boat you can sail or row, and kayaks. Crabbing gear makes for an excellent dinner as well! The "head", or bathroom on Duke was designed for comfort. Duke holds 550 gals of potable water to supply the most luxurious thing about the boat: a full soaking bathtub. Captain Ryan Downs has been living in the Northwest since 2003. He was raised in California, and fell in love with the fog and the trees when he went to college at Humboldt State University, earning a bachelors degree in history. Mostly, he studied the maritime history of the Northwest. He started working on boats in 2005, starting on tall ships, or wooden historic replica sailing ships, learning traditional seamanship. Since then, he has captained sail training, pleasure and passenger vessels, working the West Coast from Alaska to the Sea of Cortez. He has worked on the east coast from Maine to Baltimore as well as the Caribbean. Capt. Ryan holds a 100 Ton Near Coastal Masters License from the US Coast Guard. He is a Certified Interpretive Guide, and has Wilderness First Responder medical training. Captain Ryan knows these waters very well, having operated excursion vessels here for the last 10 years. He is a avid storyteller and naturalist, as well as a backpacking and kayaking guide. He bought Duke in 2015 so he can share his passion for the Northwest with guests. Duke was built in 1947 in Tacoma, WA. She is a perfect and defining example of troller fishing vessels of the era: tough built, no frills. Her lines are nonetheless graceful, and she is a stout sea boat. She has the ubiquitous Detroit Diesel 671 engine. 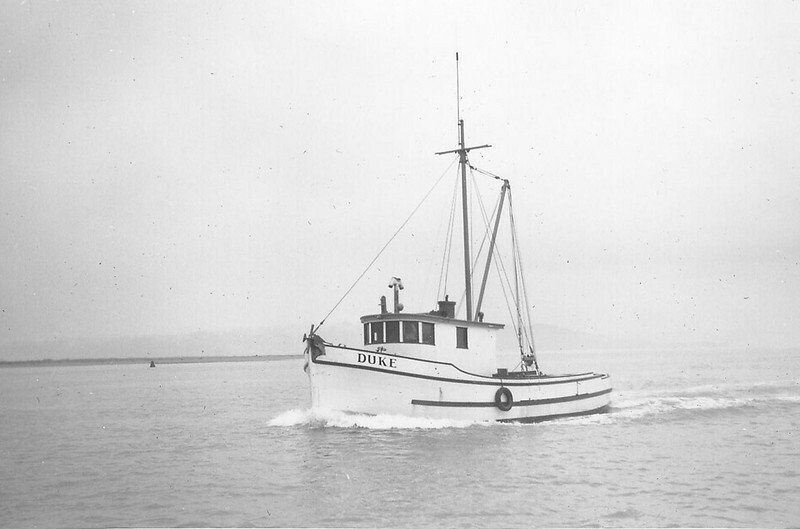 Duke began her working life in Sitka, Alaska as a fishing vessel. 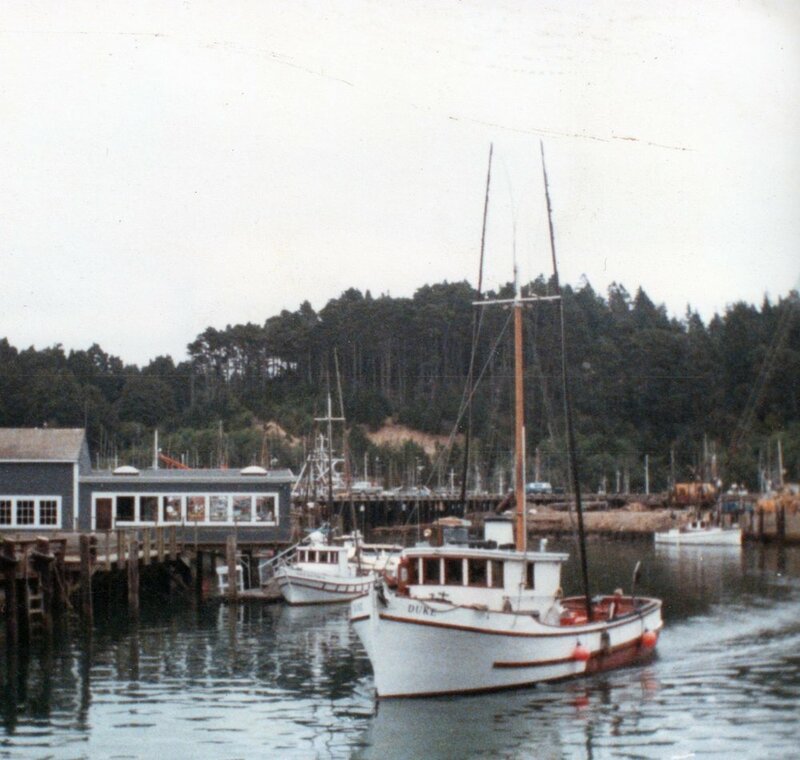 She moved down to Eureka, California in 1950, fishing to the mid 1990s. She made an appearance in the 1992 film "Jennifer 8", with Andy Garcia and Uma Thurman. She was sold again and moved to Port Townsend, Washington. She was rebuilt into a live -aboard vessel and said goodbye to her work deck. In return, she got a spacious queen-sized cabin, library, and a cozy stove for chilly nights. Captain Ryan Downs bought her in 2015 with the idea of taking passengers to the San Juan Islands and Southeast Alaska. The San Juans had been on my list for a really long time but for some reason always seemed a bit elusive. I dreamed to go without the crowds, the ferry reservations, and have access to places only explorable by boat. Capt. Ryan fulfilled my desires and created the most amazing trip imaginable. So much so, I booked another trip before disembarking from my first trip. Capt. Ryan lives for the San Juans. This covenant to the land, water, history, and culture radiate from his personal experiences, research, and some old-time sailor stories. The Duke is his wonderfully restored fishing vessel with loads of character and charm. Everything you need for a modern "off-the-grid" trip. You will be lulled into relaxation as The Duke chugs along from island to island while Capt. Ryan whips up a personalized trip for you. Whether you interested in hiking, wild life watching, or just chillin on a secluded beach... Capt. Ryan knows the spots. Capt. Ryan is a pro. He's a fun and whimsical character who always has his eyes on the horizon and safety is his number one priority. I feel at ease knowing he is at the helm while I'm grilling steaks off the stern.